Typical hot summer conditions to prevail over large parts of TN with south interior districts to record above normal temperature. Thundershowers are likely to occur in few places of interior districts in the later part of the day. Coastal areas will be hot and humid. Windy conditions will be felt at morning and evening over the coastal areas. Chennai – A slightly breezy morning leaving way to a bright and sunny day. Day high should hover around 36 degrees and a warm and sultry night to round off the day. Coimbatore – Clear and Sunny through the day. Day max should peak at 36 degrees with a slight chance of evening showers. Madurai – Scorcher of a day to expect. A high of 40 degrees and a stale and warm night on the cards. 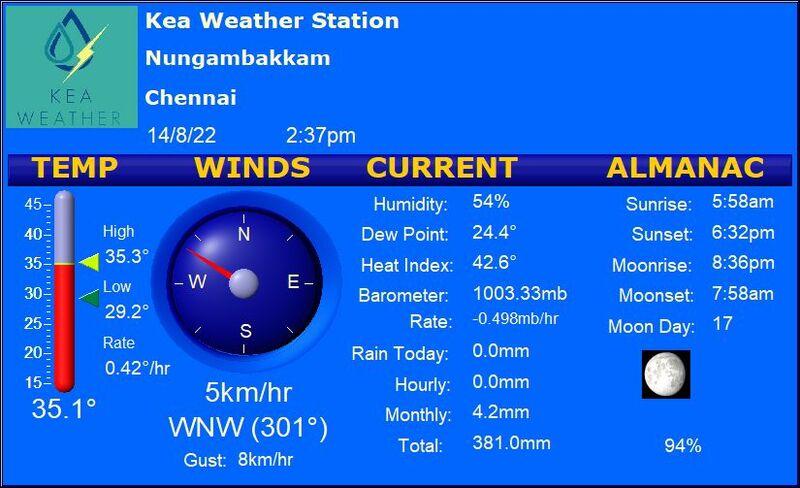 Trichy – Hot and humid conditions set to continue through the day. A high of 39 degrees. Vellore – A calm morning. Getting hotter and hotter as the day wears on. An uncomfortable high of 42 degrees seems a definite possibility.